Today is special around these parts. It's Thursday, so it's time for the weekly Grace at Home linky party, and that's pretty special on its own. But today is the 100th Grace at Home linky party, and that's worth celebrating! Grace at Home is a party for celebrating all the ways we make our homes places of grace. We are all recipients of God's grace. We are dependent upon Him for everything! It's a privilege to honor God by making our homes reflections of that grace in big and small ways. So today is a party for a party. Along with our regular linky party, I want to celebrate with everyone who has ever participated in Grace at Home. How shall I do that? Well, how about a giveaway? 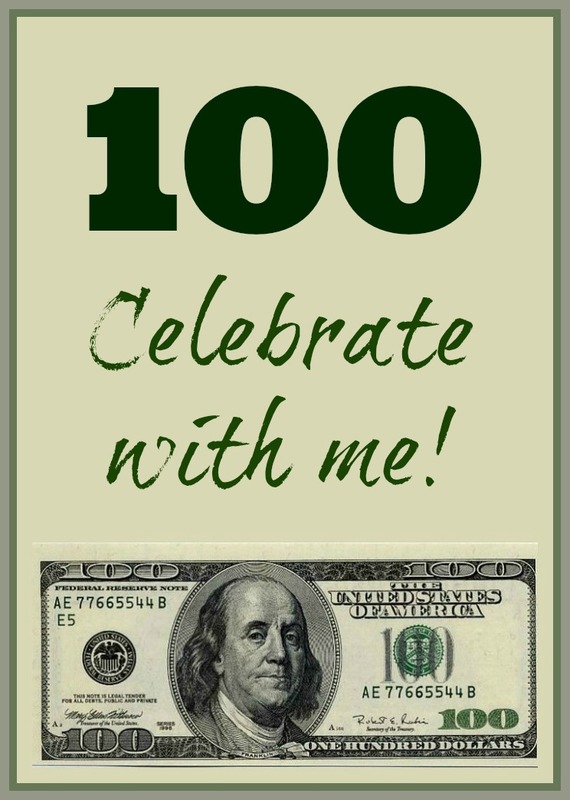 It seems to me it would be good to mark this this 100th party occasion with a $100 GIVEAWAY! Next week I'll share some favorites from two weeks' worth of parties, but for now I just want to say a special thank you to everyone who has joined this party over the past couple of years! I'm so grateful for each person who links up each week. After all, it wouldn't be a party if no one participated! I've loved meeting you and other ladies through your Grace at Home party. Thanks so much for the giveaway! Congratulations on your 100th party! I am a faithful reader but not a blogger. I really enjoy all the nice blogs and ideas I find in the Grace at home series. Thanks for hosting, Richella! I love link parties because I get exposed to new blogs that I might not have seen before. Thanks for the giveaway! Congrats on 100 parties! Have a wonderful week! Congratulations Richella!! Blog link ups are a lot of work. Thank you so much for always being the most gracious hostess. And, thank you for such a lovely and generous giveaway. By the way, your kitchen makeover is coming along beautifully. I love the updated looks and the island is stunning in that gorgeous color (teal?). Best wishes for a week filled with extraordinary God moments! Congrats on the big 1-0-0! Thanks for the great giveaway! I love discovering new blogs and lovely people. It was through your party that I met you and others as well. ;) And of course...who doesn't love all the wonderful inspiration all in one place?! Im new to the link up parties, and haven't yet down it myself, but I love seeing what everyone else is doing and finding new blogs! Richella congratulations on a wonderful achievement. I always am blessed with wonderful inspiration when visiting. Richella, Thanks for hosting and for the chance to win. Have a great day! Thanks for hosting, and for the awesome giveaway. Have a great end of the week! Hugs from Bacon Time. I like that link parties give me a chance to discover blogs I might not have known. I like seeing all the different blogs in one place. Wow! It's hard to believe you are already up to 100 parties. Thanks for hosting! I love finding new blogs & all the awesome ideas out there! I just found your party- so glad I did! Congrats on #100, Richella! What a great milestone. I visit your party every week which has led to new things to make and things to learn. My best for another #100! You have a very nice blog and I've been enjoying visiting. I love the variety of ideas all in one location. Wow, I didn't notice a sponsor, so I'm guessing you are offering 100 of your own dollars - that is so sweet! Thanks for the chance to win! I need to say that I sincerely appreciate being a part of this linkup most weeks. It can be hard to find a place to share thoughtful content, and I love that your linkup encourages it and that your community is interested in it. You are the epitome of grace in my book! I have loved each and every one of your parties - even though I've not been able to participate recently. I love having everyone's ideas in one place to peruse/glean ideas from. Thank you, Richella, for hosting and for the opportunities you give us to link and be a part of your world. I enjoy your blog and am happy when I can share with your readers. Happy 100th! Congratulations !! This is a great party ! I always enjoy the party grace at home !! Have a great week ! Thank you for continuing to host this link-up each week, Richella! I've so enjoyed getting to know you and your readers over the past couple of years! Congratulations on your 100th party!...how wonderful....thanks for hosting and have a most wonderful week!!! I like reading different blogs and getting great ideas from the blogs. Congratulations on the big 1-0-0! Thanks for all that do to truly impart the beauty of grace into our lives, Richella! I love being inspired by other people's creativity. congrats on your 100th party. I enjoy linking to the different blogs to get great ideas! I love your blog. I write a nature blog (thejardinencantado.blogspot.com) but it is not nearly as professional as your! Connections! I like finding new ideas and sharing mine. I love seeing all of the hi projects! And most of them seem pretty feasible for the average crafter! Richella, you always write from the heart, have a great party, you "keep it real" All things I appreciate. I love your link party! It's my weekly favorite! Thanks for hosting! Having everything in one spot!! I love finding new blogs to follow ! I love seeing all the different blogs in one spot! I can't believe it's already been 100 weeks. It's been a great 100 weeks too. Thanks for hosts such a fabulous party. I've enjoyed it. I love linky parties because I love to check out new blogs! So happy I found your blog! I get lots of great ideas off of your Linky Parites! Wow has it really been 100 weeks? Good for you, I always enjoy coming by your parties! Congratulations, Richella! So good to be seeing you at the Renovare conference. One of the things I do to create home is to keep mine picked up and vacuumed so that it is always ready for anyone who drops by as well as for me when I come home from a full day. I like coming in to peace and order and I think it makes people who drop by feel less like they are intruding if they come into a house that is basically in order (vs. a wreck). At least, I feel that way in someone else's home when I come in unexpectedly and it doesn't look like I've caught them at an embarrassing moment. Congrats on your 100th. week of fun for us, sweet Richella! Thank you for hosting this great party and for the generous giveaway. Enjoy your weekend. Congrats on your 100th edition! Congratulations on your 100Th linky party!! I'm proud of you! I'm not a blogger, but love linky parties, because I get to see so many interesting things. Congratulations on your 100th! of course I'd love a $100 gift, and I love finding so many creative & talented bloggers gathered together at one party … but really just wanted to say thank you for spreading your grace and sunshine throughout the blog world … you are lovely! Congrats on your 100th!! Hello, I like Link Parties to get great ideas and I have met some amazing ladies! The ideas at the parties inspire me and I get high on seeing all the creativity that has to come from good and precious souls. Thank you. I love getting new ideas for things to try in my own home. Love your blog - so many helpful insights! Yay!! Richella!! I can't believe it's already 100! Woo hoo! I like that they're all in one place! I love that they feature creativity and you get to find new blogs! Congratulations and I am so glad I found your blog? Congratulations! I love link parties for all the great DIY projects they showcase. It's always a creative bunch that shows up!